AVALON — Organizers said this year’s 17th annual Conservancy Ball, benefitting the Catalina Island Conservancy, was a great success, despite the formidable weather challenges that were present April 14. With its theme of “History in the Making,” the ball celebrated the 40th anniversary of the conservancy’s work to protect the 88 percent of the island that is under its stewardship. Not only was this year’s event the top-grossing ball in its 17 years, but it also made history because of heavy weather that made cross-channel passage by boat impossible on the day of the ball. The tail end of a rainstorm left winds whipping across the channel, leaving more than 100 guests stranded on the mainland — along with Vox Audio, the dance band and entertainment for the evening. But thanks to the generosity of vintner Geoffrey Rusack, husband of Alison Wrigley Rusack, the entertainers arrived safely and on time. Rusack’s private plane whisked the band and entertainers to the event via Catalina Island’s Airport in the Sky. 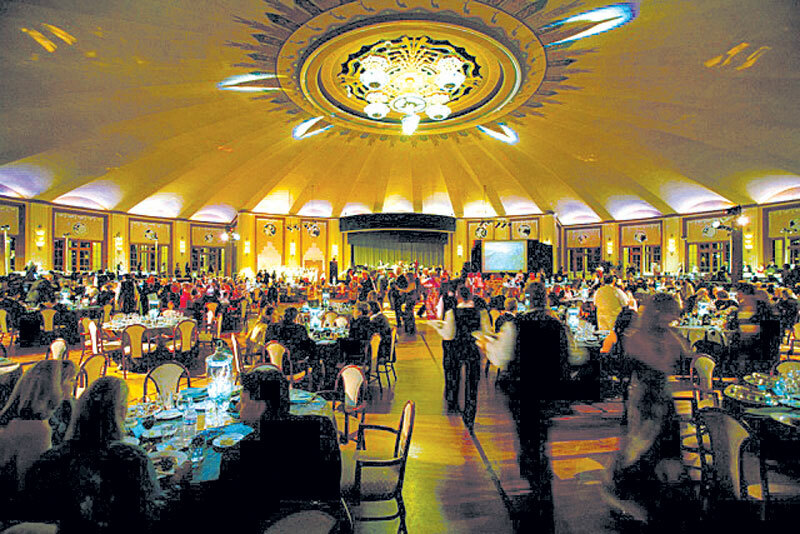 The event, co-hosted by Balboa Yacht Club, was sold out weeks in advance, and it was on course to be one of the largest balls since the event’s inception. The club had chartered Newport Flyer to bring 80 guests to and from the event on the same day, but weather conditions left the group unable to leave Newport Harbor. Instead of cruising to the island, the group held their own party back at the Balboa Yacht Club clubhouse and bid on auction items at the ball via Skype on iPads and mobile phones. Because of the weather challenges, the local community of Avalon was invited to take up empty seats and attend the event through a last-minute “will call” system. As guests made their way into the Casino, they passed by the conservancy’s new Jeep Eco-Tour vehicle and were invited to tour the new Mobile Nature Station, both making their debut that night. “We are especially grateful to ball committee co-chairs Mike and Gloria Sullivan and all who served on the committee, as well as Balboa Yacht Club Commodore Judi Gorski, for their work on this year’s record-breaking ball,” said Ann Muscat, conservancy president and CEO. In attendance were great-grandchildren of Catalina Island’s former owner William Wrigley Jr., including Alison Wrigley Rusack, Blanny Hagenah, Will Hagenah and Helen Rosburg.